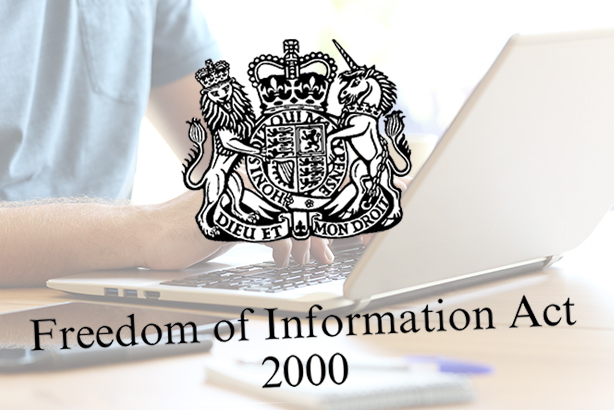 The government is disclosing less and less information under Freedom of Information laws, with refusals of FOI requests at record levels, according to the Institute for Government (IfG). In a major new report looking at government performance, the think tank revealed that government departments refused to give any information in response to almost half (45 per cent) of FOI requests in the first quarter of 2018. 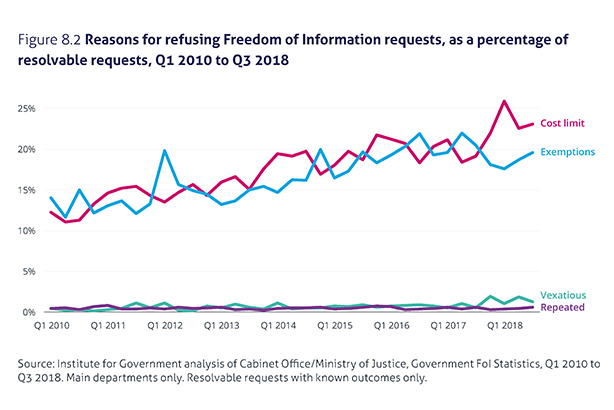 An analysis of FOI data showed that "the first three quarters of 2018 had the highest proportion of requests withheld in part or in full – more than half – since the introduction of FoI in 2005," it said. The Whitehall Monitor report, released last week, suggested reasons for the record level of refusals could include "a lack of political support for FoI" as well as departments being swamped with requests. In addition, "withholding rates may be growing because data is increasingly already available to the public". A consequence of more open data being available could be that "FoI requests increasingly seek sensitive information, which government has legitimate reasons to withhold." Nonetheless, the report stated: "Some departments are much more open in their responses than others." The Wales Office, Department for Transport and Scotland Office had granted more than 60 per cent of FOI requests in full. In contrast, the Foreign Office, DExEU and Department for International Trade "granted no more than 31% of requests in full." The increase in refusal rates has been largely fuelled by these factors, according to the report. The Cabinet Office said: "The government's commitment to transparency means we are now publishing more data than ever before. "As we do so, taxpayers will expect us to consider a range of factors including cost-effectiveness and protecting national security." FOI requests can also be refused on the grounds that they are vexatious. DExEU uses this exemption far more than other departments, rejecting 11 per cent of requests on this basis compared to the two per cent average across all departments. Only one in five FOI requests is fully successful, making it "the least transparent department in government when it comes to FoI". This could be due to "sensitive information" held by the department, which allows it to use certain exemptions. However, the IfG "has previously noted a more general lack of transparency from this department, and a low FoI response rate could further indicate this tendency." In a statement responding to the findings, DExEU said: "As the Department tasked with negotiating and delivering our exit from the EU our work is uniquely sensitive and complex. This is reflected in our FoI response figures." There is growing concern over the FOI system. Four out of 10 Britons (43 per cent) complain that information about the work of government departments is not accessible, according to the Information Commissioner’s Office. In a report released this week, it called for FOI laws to toughened up and extended to cover contracted organisations working for public sector organisations. Elizabeth Denham, the Information Commissioner, said: "The current law is not fit for purpose," adding that access to information "goes to the heart of a healthy, functioning democracy". 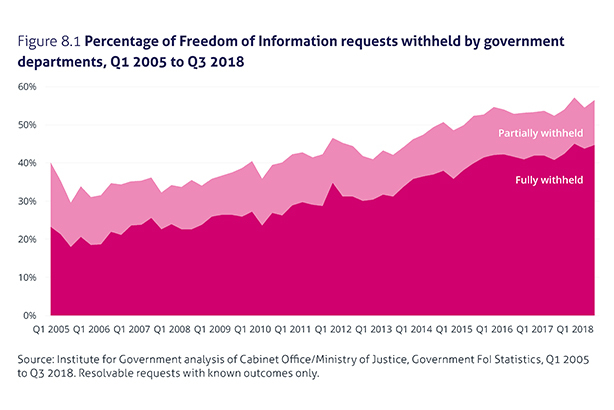 While the government is rejecting an increasing number of FOI requests, it is "increasingly proficient and active at generating its own announcements", according to the IfG’s Whitehall Monitor report. Digital channels and social media have come to the fore in terms of how the government disseminates information, it said. 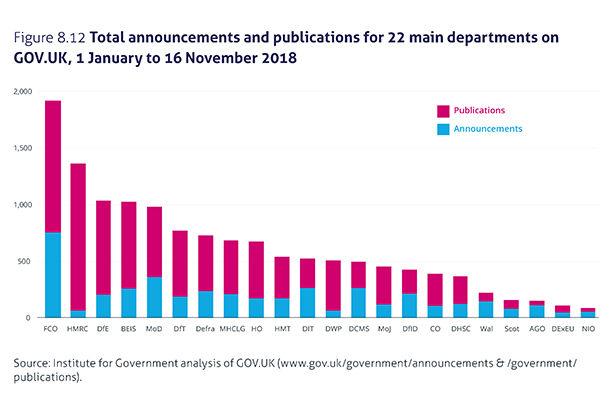 But while departments "are publishing more on GOV.UK than ever before", this is due to an increase in "more technical documents like policy guidance". And announcements in the form of press releases, news stories and speeches have declined since 2015. There are also differences between departments in terms of the volume of material they release, "reflecting their different roles and responsibilities as much as approaches to communication". The Foreign Office, for example, publishes more communications than any other department because it issues all the speeches made by its ambassadors, as well as press releases for events happening in its missions and embassies, it said. 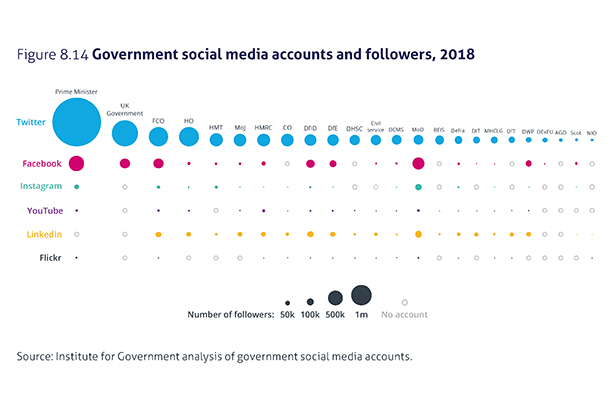 When it comes to social media, "Twitter is the most significant platform for government communications, with more than 12.5 million non-unique followers across the main accounts." YouTube is another widely used platform and, although most departments have very few subscribers, their content is viewed by large numbers of people. The Department of Health and Social Care is a case in point: its YouTube channel has less than 3,000 subscribers, but has had more than 4.3 million views of its content. "Social media also offers a way for government to project a warmer, friendlier face," the report said. The Treasury’s official Instagram account, @treasury_cat, which chronicles the exploits of Gladstone, the department's chief mouser, is the fourth most-followed government Instagram account, after the Prime Minister, the Foreign Office and MoD. 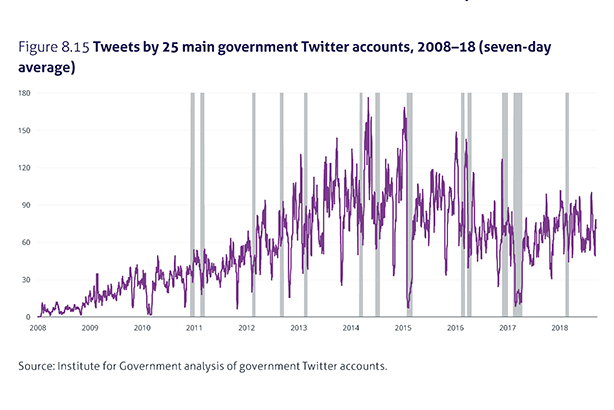 Government’s use of Twitter goes far beyond the main departmental accounts, however, with numerous feeds promoting individual campaigns and issues, or simply providing information such as air quality forecasts. More broadly, it is using social-media networks "to boost messaging about specific campaigns and services". However, as PRWeek has previously reported, some departments are more active on social media than others. The Foreign Office and Department for International Trade are notable examples of using the potential of social media – in their cases, to communicate to audiences overseas. Nonetheless, the report added: "Not all departments are using social media successfully." To date, the Wales Office has had little more than 1,100 views of all its videos on YouTube and it has tweeted more than four times as often on its English-language Twitter account as on its Welsh one. Social media also presents some risks, the report warns. One example is the use of Twitter by civil servants. "There could be some impartiality issues – how far should a permanent secretary tweet in support of the policy of the current government or minister, and what would happen if the government or minister changed, leaving behind those tweets under a new regime?" The report added: "We may see some new dilemmas as 'official' accounts change hands between individuals, and even between different governments." Yet for all the challenges and risks, social media "offers a direct and immediate means of communication". And with one in five adults in the lowest socio-economic group going online only using a smartphone, "it also has the potential to widen access to information". Which government departments are the most effective at using Twitter?